Gov. 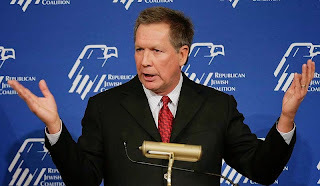 John Kasich (R-OH) concludes the potential presidential candidates' pitches before the Republican Jewish Coalition. Reactions from leaders attending the Spring meeting at the Venetian Hotel- from RJC Executive Director Matt Brooks and Commentary Magazine's John Podhoretz. Zionist Organization of America's Mort Klein recounts why an encounter with N.J. Gov. Chris Christie characterizing Judea and Samaria as "the occupied territories" raised his concerns. "I asked Andy Abboud specifically whether Christie apologized: "Gov. Christie did not apologize," Abboud replied. "He said he misspoke and regretted that he misspoke. It was very matter-of-fact. He did not come crawling in but noted that a lot of people use that term. Then they moved on. It was not a big deal." In other words, Christie acknowledged that he "misspoke" and distanced himself from the offending phrase, saying it was not "a statement of policy." But he did not retract his use of the term occupied territories or promise not to use it again. Much less did he apologize for using it in the first place. In other words, Christie withdrew tactically but still sees the West Bank as occupied territory. . . .
Christie's scornful non-response to Klein contrasts dramatically with his retreat before Adelson and provides important insights. His inconsistency points to the governor's true views (which do not bode well for Israel) and to the content of his character." How many of the other candidates would have instinctively referred to Judea, Samaria, and Gaza as the "disputed territories"? And to a broad, rather than dedicated Zionist audience?